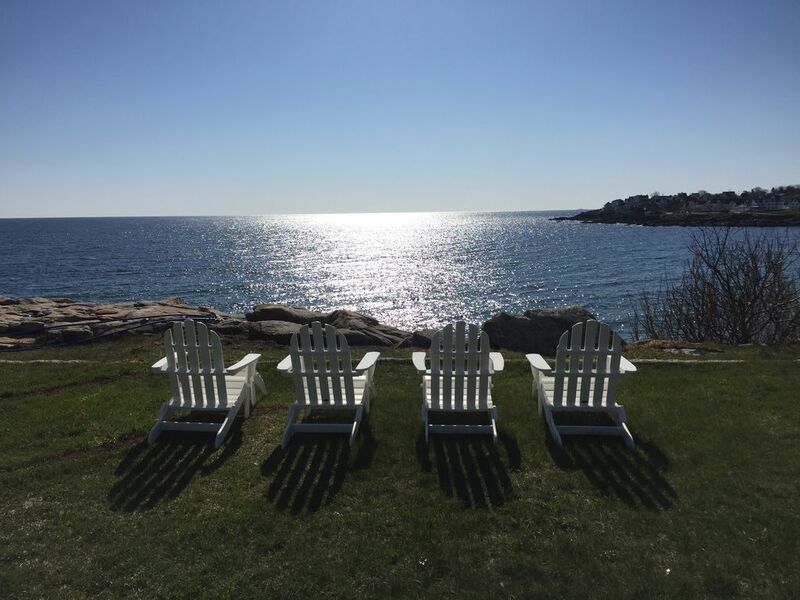 Watch the waves crash and feel the sea spray as you sit in one of the comfortable adirondack chairs on the spacious private lawn. Enjoy the cool, ocean breeze from a rocking chair on the screened in porch. Or, take advantage of the newly renovated kitchen and whip up a meal to enjoy in a dining room with breathtaking views of the Atlantic. Whatever you choose, you are sure to find comfort, joy and relaxation in this charming seaside home. This home offers 3 bedrooms (2 with queen beds, 1 with twin bunk beds) as well as a sleeping alcove with a twin sized daybed and a twin sized trundle bed. The house also has 2 full bathrooms, each renovated from top to bottom in the winter of 2016. The brand new kitchen offers stainless steel appliances, granite counter tops and a full sized washer and dryer to ensure that you have all of the comforts of home on hand. Park your car in one of the many private spots reserved for you and take a 3 minute stroll to the beach or into the quaint seaside town of York Beach. Restaurants, shops, amusements, the zoo and an ice cream cone await you! We have a pack-n-play with a changing station available, as well as a child's booster seat for feeding. The kitchen is stocked with children's sized dinnerware, cups and cutlery. We also have a selection of children's books, puzzles and games on hand, for your use. Our family lives just north of Boston. Spending time together renovating this house and exploring coastal Maine has occupied much of our time this year and given us memories to last a lifetime! We fell in love with the location of this property and couldn't get gorgeous views off our minds. While only a little over an hour from our home, it feels much farther away and we can't help but relax once we arrive! Both bathrooms have been fully renovated in 2016 with all new tile, flooring and fixtures. A 3 minute walk into York Beach yields shops, restaurants, bars & pubs, entrance to the zoo and many other amusements. Short Sands Beach is visible from your spacious private yard. It is about a 3 minute walk from the house and offers new, clean public restrooms. Enjoy stunning views of the Atlantic Ocean from every room in this home. A private yard and the rocky coast are all that separate you from Short Sands Cove and the Atlantic Ocean. This home sits directly on the Atlantic Ocean. Relax on the spacious, private lawn, right on the water, in front of this home. WOW! Ocean by day, Stars by night. WOW! Ocean by day, Stars by night. Great remodel on the inside and stunning views on the outside. Just a quick walk to town but really enjoyed getting up early and taking those long walks with stunning views everywhere. Beautiful Home , supplied with everything you need for your stay. You have beautiful views from the back of the house and it is very peaceful. The location is perfect and you are only a short walk away from the beach and shopping. The moment we arrived, we knew our stay was going to be terrific. We didn't think we would ever leave the yard, because there was no need! The view was fantastic. The home was just as beautiful. View of the ocean from every room. Comfy beds, fresh linens and towels provided. 3 minute walk to beach, restaurants and the downtown area. Megan was wonderful to deal with. Couldn't have been more helpful. I am very thankful to have spent a week away from work at such a beautiful home. Just the relaxation we needed. An amazing York stay - felt like heaven on earth! We have been coming to York for over a decade. We usually rent a different house every year based on location and what vacation week everyone is able to get. This year was absolutely incredible and it blew any other House we have ever stayed at out of the water! Amazing views, cute decor, GREAT location - right around the corner from the union bluff. Simply amazing! Beautiful house with spectacular view! We have been staying this house for almost 10 years, the last few with the house being totally renovated. As beautiful as the ocean views are, it is almost a shame to leave the house because it is so beautiful inside as well! We love that we are so close to the beach and downtown, yet can get away in the backyard and relax to the calming sounds of the ocean. On a scale of 1 to 10, this property is definitely a 20! 50% Deposit is non-refundable. In the event of cancellation, we will endeavor to re-rent the house. If a new guest is secured, we will refund the reservation deposit, less a service charge and any difference in rental fee. Please note that rates for the 2019 and 2020 seasons have yet to be established and are subject to change.